Jacques Bergerac (26 May 1927 – 15 June 2014) was a French actor who later became a business executive with Revlon. Jacques Bergerac was born in 1927 in Biarritz, France. He was recruited by the Metro-Goldwyn-Mayer studios while a law student in Paris at the age of 25. Bergerac met and married Ginger Rogers with whom he appeared in Twist of Fate (1954) (also known as Beautiful Stranger). He then appeared as Armand Duval in a television production of Camille for Kraft Television Theatre, opposite Signe Hasso. He played the Comte de Provence in Jean Delannoy's film, Marie Antoinette Queen of France. In Strange Intruder (1956), he shared the screen with Edmund Purdom and Ida Lupino and in Les Girls (1957), he played the second male lead. He also appeared in Gigi (1958), Thunder in the Sun (1959), the cult horror film The Hypnotic Eye (1960) and A Global Affair (1964). In 1957, he received the Golden Globe Award for Foreign Newcomer. He also managed the rugby club Biarritz Olympique from 1980 until 1981. 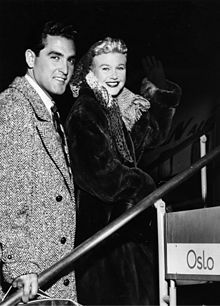 Bergerac married screen star Ginger Rogers in February 1953, and they divorced in July 1957. In June 1959, he married actress Dorothy Malone in Hong Kong, where she was on location for her 1960 film The Last Voyage. They had daughters Mimi and Diane together, and divorced in December 1964. He died June 15, 2014, at his home in Anglet, Pyrénées-Atlantiques, France. ^ "Cinéma. Mort du comédien Jacques Bergerac, ex-mari de Ginger Rogers". Ouest-France (in French). 24 June 2014. ^ a b Barnes, Mike (June 25, 2014). "French Actor Jacques Bergerac Dies at 87". The Hollywood Reporter. Archived from the original on March 21, 2016. Retrieved June 19, 2017. Article about Jacques and Michel Bergerac, people.com; accessed 14 December 2014.